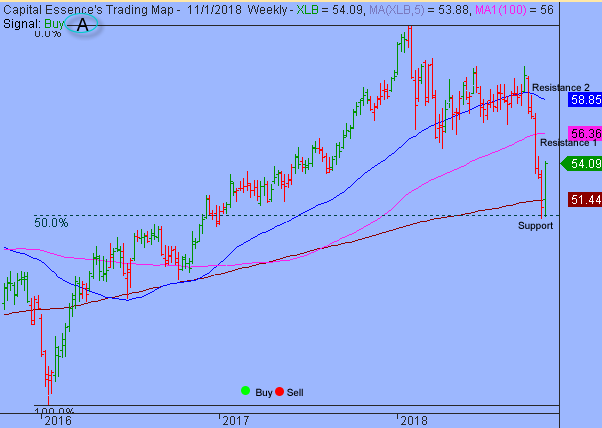 Good Morning, this is Capital Essence’s Market Outlook (the technical analysis of financial markets) for Friday November 2, 2018. We’ve noted in the previous Market Outlook that: “momentum has been strengthened as S&P moved up to test key overhead resistance but does not appear strong enough to generate widespread breakouts. While there is a high probability that the late-day selloff will momentum, an undercut below the 2680 is needed before there is any real prospect of a change in the short-term uptrend pressure. 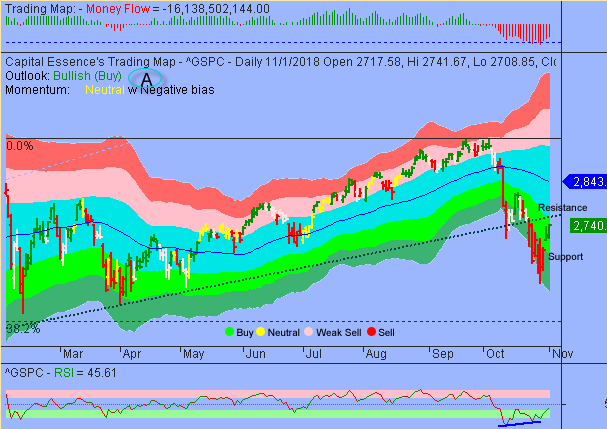 Again, expecting further whipsaws and intimidating times ahead.” As anticipated, the S&P briefly turned negative in the early Thursday session before buyers stepped in and pushed prices higher into the close. For the day, the S&P climbed 1.1 percent to 2,740.37. The Dow Jones Industrial Average added 1.06 percent to 25,380.74. The Nasdaq Composite advanced 1.8 percent to 7,434.06. The CBOE Volatility Index (VIX), widely considered the best gauge of fear in the market, fell nearly 9 percent to 19.34. The favorable trade-related tweet by Donald Trump lifted together with DowDuPont’s upbeat earnings reports lifted cyclical groups as materials jumped 3 percent. After surging nearly 22 percent in 2017, the Materials Select Sector SPDR ETF (XLB) tumbled more than 10 YTD, underperformed the S&P by a wide margin. Now the question is whether recent pullback is a pause that refreshes or it’s a beginning of something worse? Below is an update look at a trade in XLB. Our “U.S. Market Trading Map” painted XLB bars in green (buy) – see area ‘A’ in the chart. The first dominant feature on the chart is the rising trend line starting in early 2016. The second dominant feature of the chart is the downward trend since early 2018, which represented the digestion period. The late September selloff broke several key technical supports, sending the ETF down to the 50% Fibonacci retracement of the 2016 upswing. This week’s massive bullish engulfing bar is a clear indication of demand overwhelming supply. This is a positive development, opened up for a test of the strong band of resistance between the 56 and 59 zone. Thursday’s upside follow-through confirmed Wednesday’s bullish reversal signal. This is a short-term positive development but with Money Flow measure below the zero line, rallies are counter-trend and will be sold. What this means is that as the S&P inches into the area of key overhead resistance, aggressive sellers will most likely dips in their toes to see how the market reacts. Right now the most important thing to watch is the rallies and retreats behavior as the 2016 rising trend line, around 2760, is tested as resistance. There is a no reason to turn particularly bullish until this area is eclipsed. Short-term trading range: 2680 to 2765. S&P has support near 2680. A close below that level has measured move to 2600 but for now it looks firm. The index has a strong band of resistance between 2750 and 2765. A close above that level will trigger a V-shape rally but it’s not expected this week. Long-term trading range: 2300 to 2822. S&P has support near 2624. A close below that level has measured move to 2300. The index has resistance near 2738. A close above that level has measured move to 2822. In summary, Thursday’s upside follow-through had helped putting the bulls back onto the driver side of the market but it doesn’t mean that we’re out of the woods. Given the looming resistance near S&P’s 2750-2765, there is no big commitment to accumulate stocks aggressively at this point. With that said, until the overhead resistance is eclipsed, downside risk appears to heavily outweigh potential reward.